The wedding is just days away and TV Star Bharti Singh's friends and family hosted a bachelorette for her, pictures of which have been posted on social media. Bharti is marrying Haarsh Limbachiyaa on December 3rd in Goa and recently featured in a dreamy pre-wedding photoshoot. 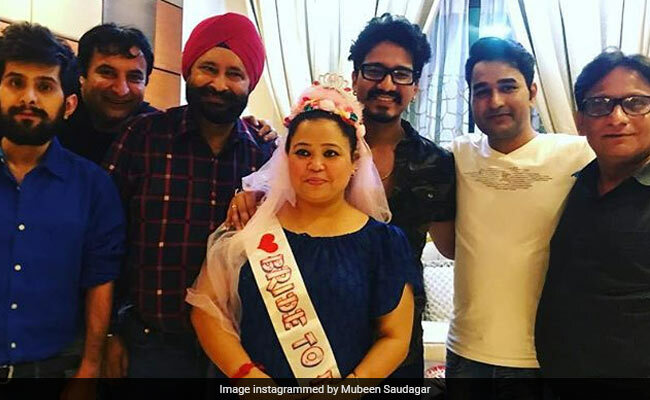 Bharti's friend comedian Mubeen Saudagar posted a couple of pictures on Instagram and said in the caption that the celebrations have begun and that Bharti is the 'Bride-To-Be.' Bharti and Haarsh got engaged in January in an extremely private ceremony. Haarsh is a scriptwriter and worked with Bharti in TV reality shows like Comedy Nights Bachao and The Kapil Sharma Show. In fact, if you look closely at the pictures Instagrammed by Mubeen, it seems that the bachelorette party was probably held only for close friends and family members at the Inorbit Mall in Mumbai. Recently, the couple delighted their fans and revealed the wedding plans. Of their wedding guest list, Bharti told Times Of India: "The guest list is too long. I have worked really hard in the industry and share a good rapport with everyone. I will be personally inviting Shah Rukh Khan, Salman Khan, Karan Johar, Madhuri Dixit, Malaika Arora for the wedding." Have you saved the wedding date yet?